My sister came up with this expression in response to my almost daily efforts to describe for her the unique – and often times bewildering – interaction I notice between my 20 month old twins. Watching them is an emotional roller coaster. 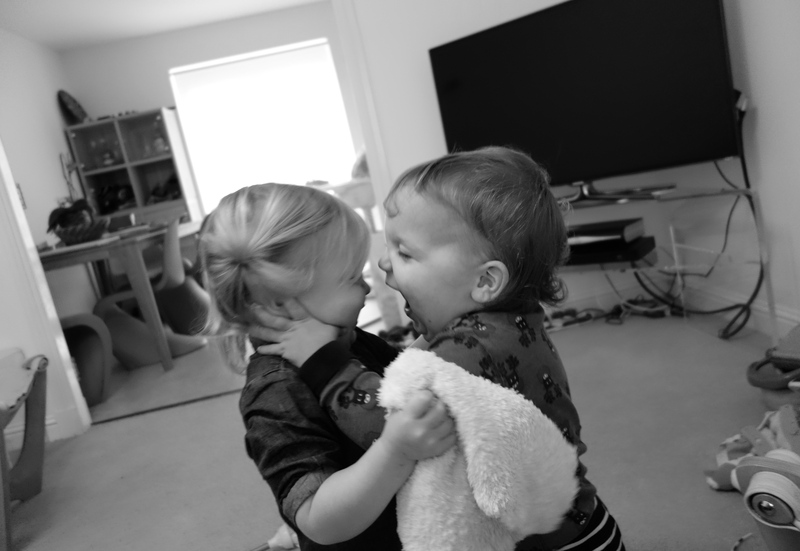 One minute I am melting at the genuine tenderness they are able to show to each other at such a young age, an age where most toddlers are so (naturally) egoistic that they demonstrate very few other-regarding tendencies at all. The next minute I am reduced to despair, jumping from my place on the couch yet again to prise them apart and hoping this time I get there fast enough to prevent any major physical fallout. Their entanglements can be vicious. Shockingly so, even to a seasoned mother of two older boys, neither of whom displayed anything like the ferocity of temper these two reserve for each other. The worst offenses involve teeth. I was embarrassed to admit this for a while, appalled by the idea of any kid biting another. But when a friend of mine came round and revealed the bodies of her own little twins, purple and peppered with bruises, I took some solace in the possibility that this habit might be more to do with their doubleness than to their inner demons. To confirm, I googled ‘twins biting’ and, wow, I am not alone. Needless to say, not all twins bite each other. Like every parent struggling with problematic behavior, a part of me wants to believe otherwise: to make the worrisome traits I see in my children the ones that are universal. It would feel better somehow to know that there is always a dominant and more aggressive twin, for example, or that twins are bound by nature to hurt each other in ways and with a frequency that consecutively-spaced siblings are not. But the reality, as with singletons, is that each pair develops in its own way depending on the usual suspects of temperament, gender and place in the pecking order. When you multiply those variables by two, it should be obvious that there is no one-size-fits-all twin-set. I still find myself wondering what my twins would have been like, for better or for worse, if they weren’t part of a set. In the harder moments, I am sure that my son would be less hostile without a sister chronically vying for the things he thinks are important: his space and his mother. In easier times, I am convinced that my daughter would be more melodramatic were the spotlight of parental attention shining solely on her as the youngest child. Of course, it is impossible to know now: too much time has gone by in which they have created a life only together. It is extraordinary to witness any toddler’s personality emerge as he negotiates the world around him. The fascinating thing with twins is to watch what happens when that world is comprised of a same-aged sibling who is always there and always at the same stage of maturity. The depth and reach of the influence they have over one another is difficult to gauge, but it must be profound. So much of their day-to-day is determined by the constant presence of a partner: the hours slept, the games played, the words spoken. In fact, all of my son’s first words came from the pre-existing pool of his sister’s vocabulary, to the point where he even adopted her idiosyncratic mispronunciations. She called our nanny, Ashley, ‘Shuh- shuh’, and so did he, despite the fact that he doesn’t have the same trouble enunciating initial vowels. If you ask one of them a question, you will often get an answer from the other, who very well might be out of view but who is so rarely, it seems, out of earshot. Pull a book from the shelf and they will ‘read’ it in entirely different ways, but even in their differences there exists an undeniable – and incredible – shared matrix of understanding. They learn from each other continually. It is perhaps inevitable that their development should feel like a joint enterprise: they are hardly ever alone. But the older they get, the clearer it is that being not alone with each other is still different from being not alone with other children, even their own brothers. Their relationship is certainly ‘special’ in this regard. We go to playgroups, we go to music class, we go to friends’ houses and at none of these places do they behave vis-a-vis the other kids quite the way they do with one another. In a circle of their peers, neither will touch the toy being passed around while it rests in the lap of somebody else. The instant it touches down in one of their own laps, however, it is fair game. They take things from each other, in this way, as if it is their right (and as any parent of twins will attest to, having two versions of the desired object doesn’t necessarily solve the problem). Theirs is an ongoing battle of staking claims and it occurs to me, as I watch it play out for the umpteenth time in a given week, that maybe, just maybe, they really think that it is a right. That from a psychological point of view each actually considers the other an extension of him- or herself, at this age in particular when a child’s sense of identity is only just beginning to crystallize. How they will ultimately develop identities that are separate from each other – but at the same time intimately bound – will no doubt define much of their early childhood. Finding that balance might not be an easy road, but at least it will be one of the many they can walk together. a bite? no, i think this one is a kiss.